Hosted by: KAKUSHINHAN, To be CO., LTD. Drinks will be paid for at the venue. *U22 Tickets are special discount tickets for audiences aged 22 or below. Limited number of tickets per performance, identification required. *The BOX OFFICE will open 1 hour prior to the performance, and entrance to seats will open 30 minutes prior to the performance. *Please refrain from accompanying children aged 5 or younger. *Once the performance begins, we may guide you to seats that are closer to the entrance. *There may be moments where the phone cannot be reached. In such cases, we will be sure to call you back. Thank you for your understanding! ★<The Merchant of Venice>Flyer ENG – front page from here! 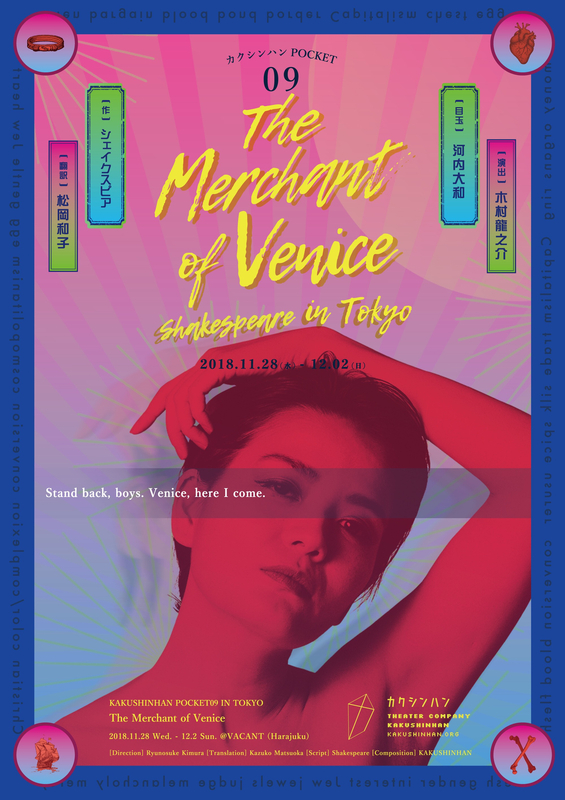 ★<The Merchant of Venice>Flyer JP – front page from here! ★<The Merchant of Venice>Flyer JP – back page from here! Copyright © 2019 Kakushinhan All rights reserved.